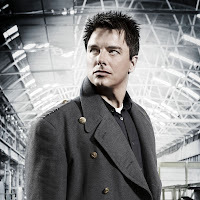 type40 - Doctor Who news and views: JOHN BARROWMAN ON WHY HE WON'T BE IN THE ANNIVERSARY SPECIAL! JOHN BARROWMAN ON WHY HE WON'T BE IN THE ANNIVERSARY SPECIAL! As previously announced, John Barrowman will not be returning to Doctor Who for this year's 50th Anniversary Special. Rumours have since spread that it's due to the flagging interest in the character of Captain Jack Harkness (who has been in Doctor Who on and off since 2005's The Empty Child, as well as being the lead character in four series of Torchwood since 2007). Barrowman stresses that if he were asked, he wouldn't have hesistated to say yes! The Anniversary Special is currently in production, and so far the only characters known to be returning are the Eleventh and Tenth Doctors, Clara, Rose and the Zygons (who last appeared on television in 1975's Terror of the Zygons up against Tom Baker's Fourth Doctor and Elisabeth Sladen's ever-popular Sarah Jane Smith). But still the fans won't accept that other Doctors and Companions are off the menu. More news when we have it!